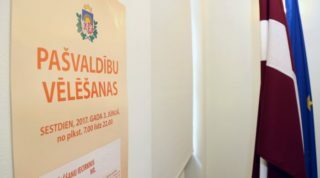 The local government election that will be held in Latvia on Saturday may lead to a few surprises, the main issue having to do with the capital city of Rīga, which has been governed or misgoverned, according to one’s views, for the past eight years by the Harmony Party in tandem with the rather clumsily named Honor to Serve Riga. Polls show that fewer than one-half of voters are prepared to vote for the tandem again, and that leads to the question whether the dozen other parties can accumulate sufficient votes to deny it the majority. Not all of them, of course, will surpass the 5% vote barrier that is needed to win any seats at all, but if the three or four parties that have a chance to do so end up winning 31 or more of the seats on the City Council, then they will have to put together a coalition. They do not see eye to eye on all matters, and there is also the possibility that Harmony/HSR will try to peel off some members to form its own majority. I personally hope that the other parties will take the majority and will be able to form a stable coalition, because Harmony in my eyes is unacceptable for its excessive and entirely incomprehensible friendship with Russia and specifically with the pocket party of the Russian tsar, United Russia. The issue of whether that will happen depends in part on the fact that right now one-quarter of voters say that they have not yet decided for whom to vote. If they break in the direction of Harmony, it will probably continue to run the city for another four years with all that that implies. Populism has been rife in this campaign. Parties are promising free health care for seniors, free public transportation rides, free health insurance for the elderly, etc., nowhere explaining where exactly the money for such largesse would come from. There have also been entirely peculiar promises. Aknīste is a small town in southeastern Latvia, and one party there is promising that if elected, it will withdraw the Aknīste Administrative District from NATO. Needless to say, that is not a local government issue, though it would certainly be interesting to see a little island of non-NATO territory amidst a sea of alliance territory. Elsewhere a party is promising to organize free tractor driving courses for young people. I truly don’t know for how many people the ability to drive a tractor is important in this day and age. There are also some interesting candidates in Riga. The Harmony/GKR coalition is led by the incumbent mayor, Nils Ušakovs, who has attracted much opprobrium for his habit of communicating on Internet Websites both in Latvian and in Russian. The New Conservative Party (which is no longer particularly new) is fielding two former employees of Latvia’s anti-corruption agency, Juta Strīķe and Juris Jurašs, who have long claimed, not without reason, that the Rīga City Council is a den of corruption. An alliance between the Latvian Alliance of Regions and the For Latvia’s Development party is fielding Mārtiņš Bondars, a former chief of staff to Latvia’s former president Vaira Vīķe-Freiberga. In other towns, there are council chairs who have been in office since God was a teenager. The people of Ventspils will probably reelect the venal Aivars Lembergs even though he is on trial for serious financial and other crimes. Uldis Sesks will probably win another term in Liepāja after 16 years at the helm, ditto Mayor Andris Rāviņš in Jelgava. All in all, there are 8,945 candidates from 599 different parties, alliances of parties or alliances of voters (this is permitted in local government elections, but not national ones). A bit more than 60% of them are men, and more than 70% are registered as Latvians; 3.7% are Russians, and if one wants to go afield in this regard, there is one Ossetian, one Finn and one Swede on the list somewhere. One way or another, Latvians will be electing members of councils in 119 administrative districts and nine cities. There is one administrative district where there is only one slate of candidates, while in other places people are spoilt for choice, with ten or more slates. Latvian citizens living abroad, of course, cannot vote in the election, because for the local government vote, you must be a resident of the relevant district. In Latvia, in turn, there is also the issue of voter turnout. If the weather is nice on Saturday, that will probably depress turnout, although precincts have already been open today, Wednesday, and will be open tomorrow and Friday, as well. No excuse not to vote, in other words. It is the duty of every citizen to vote, and I will certainly go to the polls on Saturday. Though I must say that this is the first election in my whole life where I am not yet certain for whom I will vote. Kārlis Streips was born in Chicago, studied journalism at the University of North Illinois and University of Maryland. He moved to Latvia in 1991 where he has worked as a TV and radio journalist. He also works as a translator and lecturer at the University of Latvia.